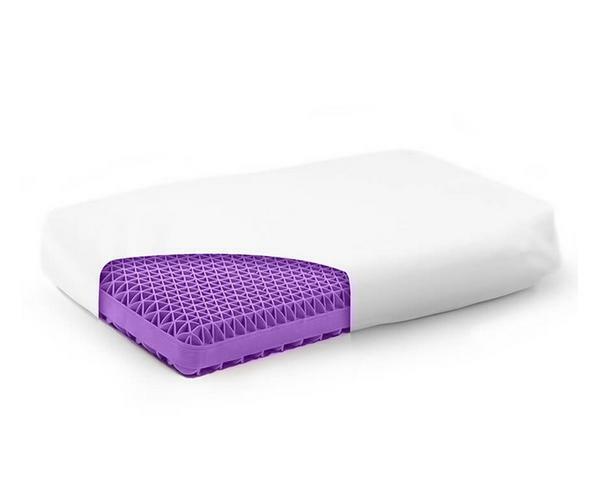 If you are sick of flipping your pillow every night, it might be time to upgrade to the Purple Pillow. This pillow promises to stay cool all night long, and there’s no need to fluff this pillow. Even though the ads are annoying, we can’t stop thinking about the Purple Pillow and how it could end up solving one of our biggest problems with getting a good night of sleep. The Purple Pillow is $99. The Purple Pillow is made of the same material as the Purple Mattress. It’s a firm, flat pillow that is designed for back and side sleepers. The pillow is designed with neck support that cradles your head. Even if you don’t have a Purple Mattress this might be the pillow for you. The edge are firm and the center is soft with open pockets that allows air to flow through the pillow while you are using it. This removes the need to flip your pillow during the middle of the night. The pillow comes with two boosters made of foam. You can use one or both to add more height to the pillow. This is important since the Purple Pillow is pretty flat compared to most pillows. There is only one Purple Pillow size, so you don’t need to choose a specific size for your bed. It is a heavy pillow, but it will keep you cool thanks to the unique design. Some reviews mention an inflatable booster, which is part of an older model and no longer an issue. One common complaint is that the Purple Pillow smells when you first unbox it. This should go away after washing it with warm water or with time. If not Purple will replace the pillow. The Purple Pillow ships free and you can try it risk free for 100 nights. You can buy the Purple Pillow at Amazon or direct from Purple.